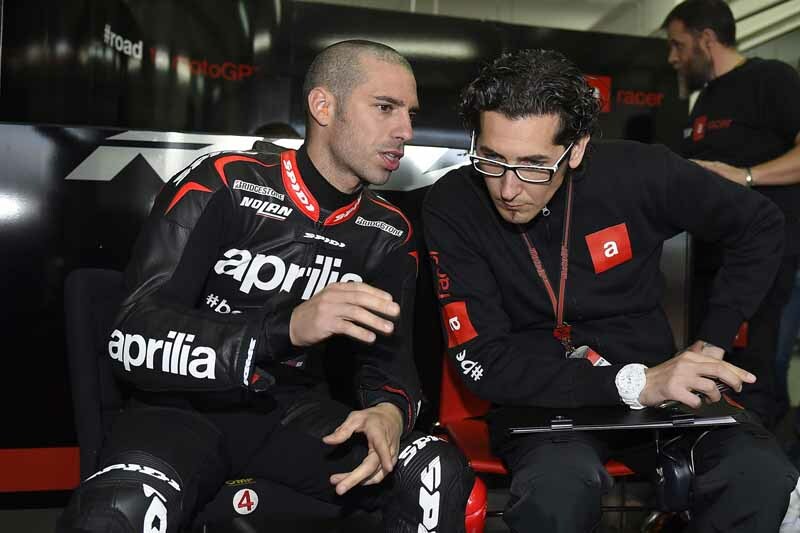 Valencia, 10 November 2014 – The lineup is complete for the team that will take Aprilia into its rookie year in the 2015 MotoGP World Championship. After the announcement about Alvaro Bautista, today Marco Melandri has officially been signed, fresh from the conclusion of the 2014 Superbike season, also with Aprilia Racing, where he took 6 wins and another 5 podiums that contributed significantly to the WSBK Manufacturer Title that the Italian Brand won. With these two new world titles earned in the recently ended WSBK season under its belt – Rider and Manufacturer – Aprilia now enters MotoGP a year ahead of the earlier announced schedule. As announced at the beginning of September, Aprilia Racing has signed an agreement with Gresini Racing, based on which Gresini Racing will mange the Aprilia bikes on the track in the MotoGP class for four years beginning with the 2015 season. Born in 1982, Marco Melandri began his career at a very young age in minimoto, winning the Italian Championship in 1992 and 1994. Moving to 125 he became Italian Champion for the category in 1997, a title which allowed him to début in the “eighth litre” MotoGP class. Third in 1998 and second in 1999, Marco moved up a category to ride a powerful 250 two-stroke with Aprilia. This was the beginning of a Melandri-Aprilia match up where he finished fifth in the rider standings in 2000, third in 2001 and World Champion (with 9 wins and 2 podiums out of 16 races) in 2002. Rising to the premier MotoGP category, Melandri immediately confirmed his competitiveness, finishing out the year in second place. In the various MotoGP categories Melandri has won 22 races and been on the podium 62 times. In 2011 Marco Melandri moved over to World Superbike and was immediately a key player, so much that he was battling for the title from his rookie season, finishing the year in second place. Finishing third in the 2012 season, the rider from Ravenna was also a contender for the title in 2013, finishing out the season in fourth place. In SBK he has taken 19 wins and 31 podiums. In its brief history, Aprilia boasts 54 World Titles (38 in MotoGP, 7 in Superbike and 9 in off-road disciplines) which make it one of the most victorious brands on a global level in motorcycle racing. Many recent protagonists in the motorcycle racing world have raced and won with Aprilia such as Biaggi, Capirossi, Rossi, Melandri, Simoncelli, Stoner and Lorenzo. 5 motoGP wins makes him the fifth winningest MotoGP rider still riding professionally. That verifies him as a worthy competitor, but also vilifies MotoGP as a sport. Melandri is a pretty good rider, but he is getting pretty old(32? )and has ridden for Honda, Kawasaki and Ducati (besides Aprilia) in MotoGP over a 9 year span and has only won 5 races in his entire MotoGP career. He will be going against riders who win that many nearly every season, or did until Marquez showed up. Surely Melandri’s best years are behind him. Now on an new, unproven product,I don’t expect a lot out of him. Guess Aprilia is going to use him as a test rider and product developer. Surely they can’t be expecting spectacular results from him at this point in his career. I wish him the best of luck, but view Melandri as a middle of the pack rider at best. Certainly no threat to the aliens. Melandri’s 5 MotoGP wins are 5 more than the majority of people ever to ride the class have to their credit. Winning in MotoGP is an expectation that only 4 people (Lorenzo, Rossi, Marquez, Pedrosa) can currently have placed on them. Nobody else has a real chance. Hey Glen asked if anyone had anything to say about Melandri, so I said something how I felt. I agree Dave, and not knocking Melandri’s accomplishments….certainly a great feat for any motorcycle racer. More wins and podiums than some ex World Champions have on their resume. But…what do you think he will add to Aprilias efforts in MotoGP moving forward? Would he have been your first choice to sign as a rider considering the expense and importance of Aprilias reentry into MotoGP, or would you have chosen a hot shot Moto2 or Moto3 pilot, eager, hungry and 20 years old with their future in front of them? They call Rossi the old man. Melandri is only 3 years younger or so I believe. Sweet, looking forwared to seeing more of Marco’s hot girlfriend. So this is all anybody has to say about Milandri?